It's post-WWII England and young author Juliet Ashton (Lily James) is in the midst of promoting her latest book when she receives a letter from Dawsey Adams (Michiel Huisman), a member of a mysterious literary club started in Guernsey, when it was occupied by the Nazis. Dawsey has found a book Juliet once owned and wants to know if she has any idea where he can get another, similar book, as books on Guernsey are limited. Juliet's curiosity is immediately piqued, and she decides to visit the island unannounced. 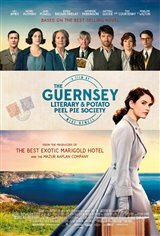 There, she meets the eccentric members of the Guernsey Literary and Potato Peel Pie Society, including Dawsey, the rugged and intriguing farmer who wrote her the letter. However, they all seem taken aback by her sudden appearance. As Juliet learns the story of what happened to this group of people during the war, she's curious about the one member who's conspicuously absent - Elizabeth, who has a young daughter, Kit. Dawsey is taking care of Kit, but he and the other book club members won't talk about Elizabeth, except to say she was arrested by the Nazis and has not returned following the war. Determined to find out what happened to Elizabeth, Juliet stays on the island, despite her new fiancé's pleas to return to London. "I just finished watching it and it was a lovely movie."